Thursday evening's Evening Telegraph carried reports of concerns from trade unions about the impact of Dundee City Council having 1000 fewer employees over the last year. Even the SNP's finance spokesperson has said of these job losses that 'It would be unrealistic to claim that this has had no impact on the city council,' he does go on to talk about protecting front-line services. There is no doubt that the cuts in employee numbers are having an impact both on services and on those still providing council services. Recent events in social care demonstrate the position which councils are in. Over many years, from governments of differing politics, councils have been encouraged to outsource social care and care for the elderly. I'm not totally opposed to service provision by the private and voluntary sector but we see in the case of Southern Cross who are in financial difficulty that it will be local authorities who will be expected to deal with the repercussions of market failure. I would not want old people left to fend for themselves and it is right that local authorities should provide safeguards. It does beg the question however about what risks the private sector takes, if it can make profits its appropriates these to itself and its shareholders, if it cannot it abandons the service. These are tough times economically for local government but I think that this issue demonstrates that cheapest is not always the best and that the private sector is not the answer to every problem. I think that comments made by the Archbishop of Canterbury, Rowan Williams in the New Statesman are very interesting. These remarks have been reported mostly as attacks on the Coalition Government but it worth pointing out that there are also criticisms of the left and Labour in his remarks. I do think that the Coalition's policies will have an impact on society and that the full implications need to be examined. One of my previous jobs was for a faith-based charity and campaigning body, Justice and Peace Scotland, therefore I do think that churches and faith-based bodies and church leaders do have a right to make their views heard on the issues of the day. I will not always agree with them but I will not deny them the right to have their say. I think that it is worth examining the views of the Archbishop and responding to them rather than discussing whether he has a right to have a view. 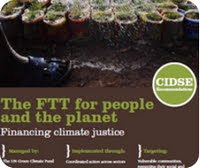 I was interested to see that the coalition of Catholic aid agencies in the European Union CIDSE has produced a report calling for the G20 to implement a Financial Transaction Tax. You can sign a petition to show your support for this at the bottom of this page. The Financial Transaction Tax is a levy on the movement of money in financial transactions, this is a small way of making the banks pay for the financial problems which they have in many senses created. This is, of course, the idea behind the Robin Hood Tax which I support. I welcome the work done by the UK Government's Department for Education in commissioning the report Let Children be Children. It is important that children are allowed to grow up at their own pace and that they are not forced to grow up too soon. The media in particular has a duty to ensure that children are not confronted with inappropriate images and expectations on them. The retail sector also has a duty, which some of the them seem to have woken up to, to ensure that children, particularly girls are not offered inappropriate clothing in particular. In the last session of the Scottish Parliament my friend Marlyn Glen was part of an investigation into sexualised goods aimed at children, with the Equal Opportunities Committee. Parents also have an important role to play as the principal educators of their children but society has to support them in their important role and these reports might go some way to doing that. There is a real issue about the image of females portrayed by the media and by the expectations of the retail sector. I will be keeping an eye on this and I hope that this will make a difference. 'How on earth can an energy company that makes £1.2 billion profit justify a 19% price hike?' This is question asked by the Evening Telegraph the other day in response to the price hike from Scottish Power. I think that the answer is that it can't. At a time of rising prices across a whole range of items this is particularly difficult for people. I will be hugely surprised if similar price hikes don't happen from other energy companies. I am concerned that such price rises add to the numbers who live in fuel poverty (that is spending 10% or more of income on fuel bills.) In Dundee I have been impressed by the work of the council's Dundee Energy Efficiency Advice Project, this organisation can offer help and advice to people in the city. I will be seeking a briefing about how the council is battling fuel poverty. The Evening Telegraph concluded that 'Gas and electricity are essentials and yet consumers are getting an increasingly raw deal when the bills come through the door. That needs to be addressed - and quickly.' I agree with their take on this I think that being able to heat and power the home to an adequate level at a price that is affordable, I think that energy companies need to think about their corporate social responsibility when it comes to setting fuel bills. As Labour's Leisure, Arts and Communities spokesperson today I welcome the news that the McManus: Dundee Art Gallery and Museum will be hosting an exhibition from the V & A to celebrate the Queen's Diamond Jubilee. I am delighted that this V & A exhibition will be hosted at the McManus. It is great to see that this great British museum is allowing the city to mark this important national event. It is great that this exhibition is part of the programme which will showcase the work of the V & A prior to the opening of the V & A at Dundee. The McManus is a well-loved institution in Dundee and I hope that this exhibition will attract many visitors to the museum, I am sure that it will. If we were starting for scratch I think that we would choose a republic as the means of organising the state, but I think that it is right that we mark the service of the Queen over the last 60 years. I also think that this exhibition will be very interesting from a social history point of view, looking at changing attitudes to the Queen over time. 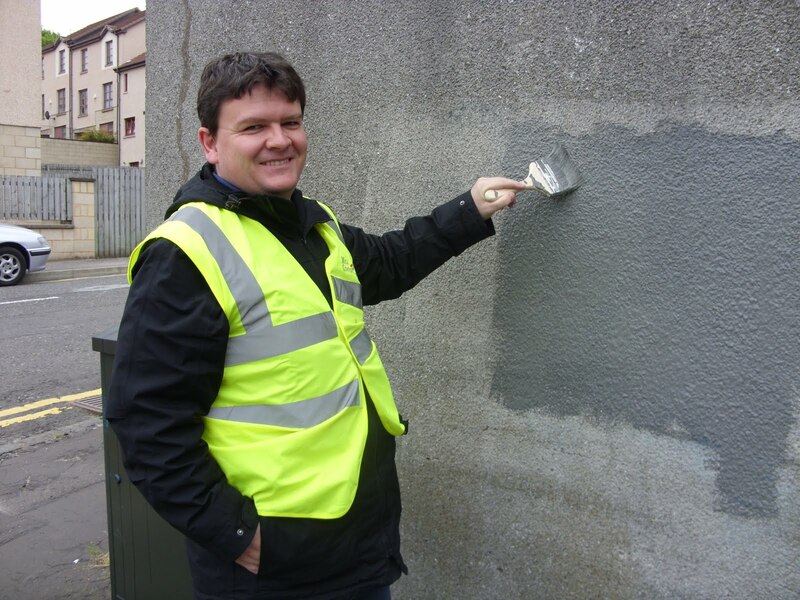 On Saturday along with a number of local people, council officers and fellow ward councillors Donald Hay and Fraser Macpherson I took part in a graffiti paint-over initiative. This group took some practical action and dealt with the scourge of graffiti by painting over it in a number of locations in the West End. This initiative started last year and while it is not a total solution to the problems of graffiti it does demonstrate that local people will not just allow graffiti to happen and do nothing about it. We all have a role to play in this, there should be zero tolerance of graffiti. Well done to those who arranged and took part in Saturday's event. 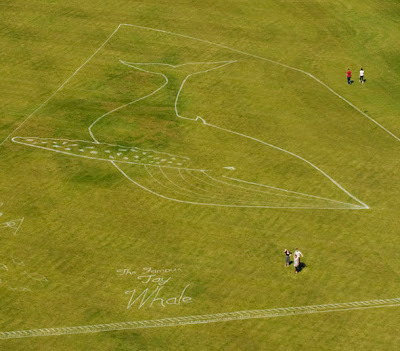 As part of WestFest a picture of the Tay Whale has been painted over three football pitches at Riverside. The picture in the BBC report shows me in standing at the very bottom of the picture. There is also a report on this from STV News at Six from last Friday, the report starts at 14.28 minutes. There is also a report on STV's website. I was pleased to get a look at the Tay Whale on Friday, well done to WestFest for all their work on this. I'm looking forward to WestFest and I hope that it is a great success.